Thanks for your letter, and above all thanks for your promise to come here as early as the twentieth. Surely the reason you mention [not feeling well] will hardly contribute towards making your train journey a pleasure trip, and it is only right that you should put off your journey until you can manage it without trouble. But apart from that I almost envy you your journey, which is going to show you miles and miles of landscapes in the splendour of autumn. There is still present to my mind the emotion by my own journey from Paris to Arles last winter. How I peered out to see whether it was like Japan yet! Childish, wasn't it? Listen, the other day I wrote you that my eyesight was strangely tired. All right, I rested for two and a half days, and then set to work again, but without daring to go out into the open air yet. I have done, still for my decoration, a size 30 canvas of my bedroom with the white deal furniture that you know. Well, I enormously enjoyed doing this interior of nothing at all. Of a simplicity à la Seurat. With flat tints, but brushed on roughly, with a thick impasto, the walls pale lilac, the ground a faded broken red, the chairs and the bed chrome yellow, the pillows and the sheet a very pale green-citron, the blanket blood red, the washstand orange, the washbasin blue, the window green. By means of all these very diverse tones I have wanted to express an absolute restfulness, you see, and there is no white in it at all except a little note produced by the mirror with its black frame (in order to get the fourth pair of complementaries into it). Well, you will se it along with the other things, and we will talk about it, for I often don't know what I am doing when I am working almost like a sleepwalker. It is beginning to turn cold, particularly on the days when the mistral blows. I have had gas laid on in the studio, so that we shall have good light in winter. Perhaps Arles will disappoint you, if you come here in mistral weather; but you wait … It is only in the long run that the poetry of this place penetrates. You will not find the house as comfortable yet as we shall gradually try to make it. There are so many expenses! And it can't be done all at once. But I believe after all that once you are here you will be seized like me with a rage for painting the autumnal effects in the intervals between the spells of mistral, and that you will understand why I insisted on your coming here, now that we are having very fine weather. Well, we'll se each other. Vincent van Gogh. 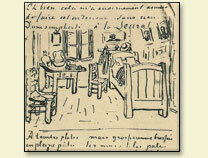 Letter to Paul Gauguin. Written 17 October 1888 in Arles. Translated by Mrs. Johanna van Gogh-Bonger, edited by Robert Harrison, number B22.